In addition to being a much-needed and wonderful vacation, my latest trip to Switzerland was a photographic success. 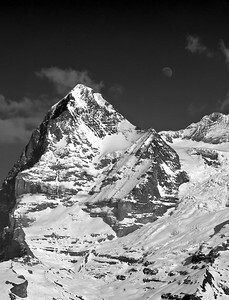 I was very lucky to capture photos of a moonrise over the Eiger. On our way to the train station to take us back down into the valley below, we stopped at a cafe for some cocoa and apple strudel. I had zoomed all the way into the Eiger’s north face to see if I could pick out the windows of the Jungfrau railway carved into the side, when I had an”oh my god!” moment. The moon had just risen above the peak! I quickly snapped off a few dozen pictures. Sometimes it’s better to be lucky than good. The Jungfrau railway windows, btw, can be seen near the middle of most of photos. Look for the thickest slab of snow, that appears to rest on top of a cliff. The windows are just below. Posted: March 11th, 2012 under Uncategorized.